Having diarrhea occasionally is usually nothing serious. It can still make life miserable. So many underlying issues can cause diarrhea. You may have diarrhea just by eating a meal that has an ingredient your stomach cannot tolerate. Alternatively, it could be stomach flu. Once you have experienced diarrhea, it is essential to know what to eat after diarrhea to avoid worsen symptoms or recurrence. Read on to find out what to eat and what to avoid. Knowing basic diet guidelines helps to improve your conditions and avoid making your diarrhea worse. Certain foods will also help accelerate recovery. Keep in mind that it is best to eat a clear liquid diet after diarrhea, including apple juice, weak tea, frozen pops, clear broth, plain gelatin or simple water. Clear liquids will help prevent irritation. It is equally important to eat smaller meals more frequently to avoid putting stress on your digestive system. You can switch to a low-fiber diet after a couple of days of diarrhea. Be sure to drink water to avoid becoming dehydrated. Include food high in pectin in your diet, like bananas, applesauce, and yogurt. Do not eat food that causes gas, such as carbonated beverages and chewing gum. Eat food rich in potassium, such as sports drinks, fruit juices, bananas, and potatoes without the skin. This helps cover loss of potassium through diarrhea. Avoid food with high fiber and high-fat. Avoid sweet foods such as cookies and cakes, greasy, and fried foods. Increase your protein intake to avoid fatigue. Eat more pork, lean baked beef, chicken, turkey, or well-cooked eggs. Limit your use of milk and milk products which are quite hard to digest. Avoid very cold or hot food or they will irritate your digestive tract. Eat vegetables but not raw. You can have soups made with cooked asparagus tips, carrots, beets, mushrooms, peeled zucchini, celery, or a tomato puree. Avoid alcoholic, caffeinated, or carbonated beverages. Stop smoking in the healing process. Once you have recovered from diarrhea, there are some food options you can try to speed up the healing process. Here are 5 common options you should follow after diarrhea. You will lose bodily fluids due to diarrhea, so it is important to replenish fluids through clear fluids, such as water, broth, and juices. If you want to eat solid foods, you can add bland vegetables to your soup. Adding chicken breast to soups will also provide you with helpful protein and nutrients. Clear juice varieties such as white grape juice, apple juice, and light cranberry juice are quite beneficial after diarrhea. You can also take some soft drinks like ginger ale, plain water, and sports drink that contain sodium and potassium to avoid dehydration. Yet, avoid alcohol and caffeine because they can dehydrate your body. You get minerals, vitamins, and antioxidants from vegetables and fruits, and these nutrients really help prevent further infection. However, you should only eat bland fruits and veggies, such as cooked carrots, bananas, and mashed potatoes soon after initial recovery. Increase your portion size after a couple of days and eat cooked peas, steamed cauliflower, berry smoothies, or unsweetened applesauce. Cereals, whole-grain breads, legumes, and other high-fiber food can aggravate diarrhea. Therefore, you should stick to food with low-fiber content, such as egg whites, toasted white bread, soda crackers, or chicken. Being a bland-food diet, BRAT stands for Bananas, Rice, Applesauce, and Toast. The diet works because it includes low-fiber, "binding" foods that make your stools firm. You should also try the BRAT diet when you have vomiting because it helps ease vomiting and nausea, especially during pregnancy. Increasing the number of good bacteria in your gastrointestinal tract will also help cure diarrhea. You can do it through a dietary supplement or food that contains live bacteria. You can eat kefir or yogurt because they contain probiotics that help restore balance in good and bad bacteria in your gut. Remember to go for low sugar varieties of kefir and yogurt. While you already know what to eat after diarrhea, you may still benefit by sticking to a specific whole-day diet routine after diarrhea. 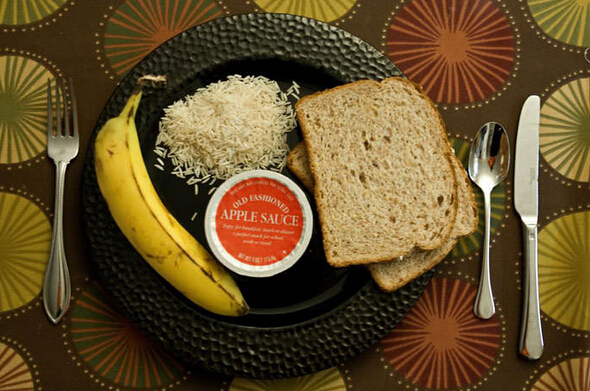 Start your first meal with applesauce, bananas and toast. If you are already feeling better, you may opt for some other foods. You can eat crisped rice cereal or cook eggs with some butter. Rice cakes, low-fat yogurt, and hot cooked cereal are also some good breakfast options. You can have chicken broth, canned tuna, crackers, chicken noodle soup, vegetable soup, plain pasta, or sandwich with lean protein. Keep in mind that you do not have to wait until lunch to eat these. You can have them any time between breakfast and lunch. You will start regaining some strength by the end of the day and that is when you can eat lean meat, baked potatoes, and steamed vegetables. You will feel better when you keep an eye on what you eat. Once your condition improves, you can go back to normal eating routine. Just bear in mind that it is important to avoid food that irritates your stomach.